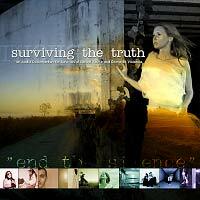 Surviving The Truth is an audio CD that was released on January 21, 2005. Haullie Free is the producer and editor of this Audio Documentary for Survivors of Sexual Abuse & Domestic Violence. You can find out more about this CD at surviving.alltheseyears.net. Haullie Free of alltheseyears.net along with 16 Survivors have spoken out on this CD compilation of blended voices to tell a story of survival and a need for change. Click the details link to find out more about this remarkable and vital project! 50% of the proceeds from the sale of the CD is going to RAINN, with the other half is going towards buying bulk CD's to sell at RAINN events. 'Surviving The Truth' (CD cover is shown to the right) is a Testament to the Spirit of Survivors from all around the world. Producer & Editor Haullie Free, takes Survivors on a Journey towards enlightenment and personal validation of their voices. Along the way Haullie discovers that at least 80% of the Survivors who had the courage to speak out were victims of more than one type of violence in their lifetime...Making Sexual Assault and Domestic Violence an even more reflective issue for anyone who will see a piece of themselves inside of these audacious Survivors. Each of the 15 tracks on this CD are layered over piano music (Completely Tori Inspired as many may tell) along with the voices of those 16 Survivors. The CD includes a full color fold out including the Survivor's Photos, Statistics, Poetry and Quotes. I strongly urge all Dent readers to take a closer look at this project. You can find out more details and how to buy the CD at surviving.alltheseyears.net.